This selection of post-war pubs comes from 1961 editions of in-house magazines from two London brewing behemoths, Watney’s and Whitbread. To reit­er­ate what we said a few weeks ago, the pri­ma­ry point of this series of posts is to put the mate­r­i­al in these pub­li­ca­tions some­where where oth­er peo­ple can find it. And, for clar­i­ty, we should say that these pubs weren’t all built or opened in 1961 – that’s just when the mag­a­zines cov­ered them. Where a date of con­struc­tion or open­ing is giv­en, or is avail­able from anoth­er reli­able source, we’ve includ­ed it, along with the names of archi­tects and pho­tog­ra­phers where pos­si­ble. Pho­to: A.C.K. Ware. Archi­tect: Alan Chalmers. This Whit­bread pub was the per­ma­nent replace­ment for a pre­fab that was erect­ed as a stop­gap imme­di­ate­ly after World War II. The lounge, in black and white, was dec­o­rat­ed with repro­duc­tions of paint­ings of chick­ens, the Buff Orp­ing­ton being a breed of hen. The tap room (pub­lic bar) had lemon walls and a red and blue tiled floor – so, some­thing like this? Is it still there? Yes, under the name The Buff, and it’s yet anoth­er post-war estate pub run by Greene King who seem to be keep­ing it in good nick, even if it has had some faux-Vic­to­ri­an bits glued on. Where in the old house were shut­ters and frost­ed glass are now clear panes and airy lou­vres. Spe­cial atten­tion has been paid to heat­ing and ven­ti­la­tion; a pleas­ing fea­ture is the light­ing – more and small­er bulbs giv­ing bright­ness with­out glare. Rich­ly hued woods in servery, coun­ters and doors set off with light paint and wall­pa­per… An unusu­al fea­ture is the porce­lain han­dles of the beer pumps. On each is a repro­duc­tion of the inn sign. We can imag­ine some peo­ple read­ing that think­ing that the shut­ters and frost­ed glass sound much nicer. This one is no longer in oper­a­tion hav­ing been turned into a take­away restau­rant fair­ly recent­ly, it seems. Every day, we come across some­thing from thir­ty or more years ago which chimes with present-day issues in the world of beer. Here are a cou­ple of relat­ed notes. Obser­va­tion 1: big brew­eries in the 1970s strug­gled to find a sat­is­fac­to­ry approach to the ‘real ale craze’ just as the ‘leisure bev­er­age’ com­pa­nies they became are grap­pling with how to get in on ‘craft beer’ today. 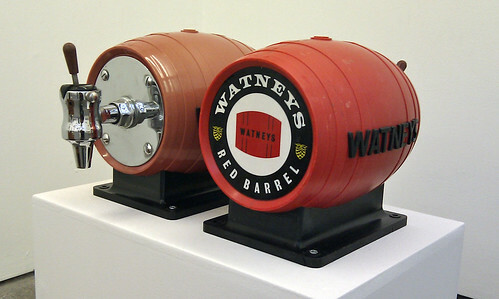 Watney’s approach to real ale has so far been mut­ed. It has exper­i­men­tal­ly intro­duced at a few of its Lon­don pubs, at 35p a pint, cask-con­di­tioned beer brewed in Nor­wich. (It says its real beer trav­els.) There has been no big pro­mo­tion­al fuss, and it is hard to see how there could be for a prod­uct whose appeal is that of not being a big-brew­ery mass-pro­duced beer. The Econ­o­mist, 10 July 1976, p99. ‘Real ale’ being more clear­ly defined than ‘craft beer’ meant big brew­eries could eas­i­ly pro­duce prod­ucts that met the tech­ni­cal cri­te­ria, but what they couldn’t do was make beer geeks love them. It was cer­tain­ly real ‘real ale’, rather than ‘faux craft’, and CAMRA gave wary nods of approval, but Wat­ney cer­tain­ly weren’t in from the cold. They’d been the bad­dies for too long, and their inter­est in real ale just didn’t seem sin­cere. Obser­va­tion 2: regional/family brew­ers have always mud­died the water. How do you make sense of them as part of a vague­ly hip­py­ish small­er-is-bet­ter, stick-it-to-the-man ide­ol­o­gy? The Guardian, 19 June 1978, p4. The Big Six all had the DNA of fam­i­ly brew­eries, but had lost their human­i­ty. Region­al brew­ers, on the oth­er hand, were only ever a step away from becom­ing bad guys them­selves. A lit­tle growth spurt; a takeover here and a clo­sure there; a lit­tle too heavy a hand with the brew­ery tie and… well, look at Greene King, who were heroes in the 1970s, but now seem to be vil­lains. Pic­ture by Mar­tin Deutsch, from Flickr, under a Cre­ative Com­mons License. It was tak­en at an exhi­bi­tion on the work of the Design Research Unit which we saw when it stopped off at the Tate Gallery in St Ives.